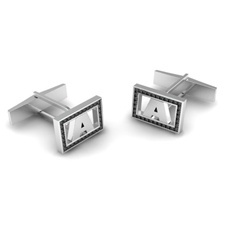 These Initial Cuff Links are sure to catch your eye with the extra sparkle of a diamond border. Cuff links are available in sterling silver, 10, 14k and 18k yellow and white gold, 14k and 18k rose gold, palladium and platinum, with your choice of either white diamonds or very elegant, and very fashionable, black diamonds. Cuff Links are available in a variety of metals and with in white or black diamonds. Price quoted below is for 14k gold with white diamonds. 32 diamonds rim each cuff link with a total weight of approximately .62 carat for both cuff links together.